Jesus says "Let the little children come to me. Do not stop them!" While Baptism is the sacrament that begins our journey in the Church, it does not complete it. Confirmation and Eucharist (First Holy Communion) are the three "Sacraments of Initiation", by which we become full members of the family of the Church. In the Catholic Church we believe that children (with the support and guidance of parents and others) can share the journey of faith, and these sacraments are one of the ways in which that faith is received and nourished. This programme is for children between the ages of 6 (School Year 2) and 16. As the above quote makes clear, once children reach what is called the “age of reason” sacraments are not “done to them” but celebrated with them, taking into account the child’s ability to choose a faith and practise it. When an infant is baptised, it is “in the faith of parents and godparents”, but when an older child is baptised it is in their own young faith. Baptism of children of this age will lead to the Sacraments of Confirmation, Reconciliation and First Holy Communion in the following year. Children and parents will come to an introductory meeting on at Church. Then, at a special ceremony the following week the children will be welcomed as “Junior Catechumens”, which means they are on the course of preparation for Baptism. They will attend Mass each Sunday (with the help of a week-by-week workbook). Between September and December there will be four instruction sessions preparing for their Baptism or Reception into the Church on the Feast of the Baptism of the Lord at the beginning of January. They will then join the children on the Sacramental Programme and prepare for First Holy Communion and Confirmation. The Church teaches that complete membership of the Catholic Church is given by three Sacraments: Baptism, Confirmation and Eucharist (Communion). In the West, we baptise in early infancy, and defer the other Sacraments of Initiation until a child has at least reached the "age of reason" (seven years old). In most Dioceses of the world, this is the age at which First Communion is given - Confirmation being deferred to a later age. Recently Bishop John has revised the preparation for and celebration of these Sacraments: Confirmation will now be celebrated when our young people are in Year 8 – the first such celebration will be in the year 2021. First Confession and First Holy Communion are normally celebrated in Year 3: each year parents of children going into year 3 in September are invited to enrol their children on the programme: from September to the following May the programme will enable our young people to be ready for the Sacraments by which they will belong fully to the Family of the Church. Our children’s preparation is done primarily by their attendance at Sunday Mass, where they can listen to God’s Word in the Children’s Liturgy of the Word, and join in the prayers at the altar where Jesus gives us his Body and Blood. 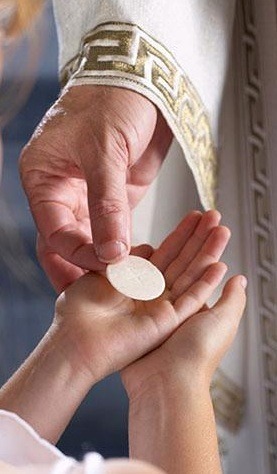 By watching, listening and joining in the children will become more and more open to the amazing gift of Holy Communion! If you have a child who has been baptised and has entered Year 3 this September, and would like them to take part in the programme this year, please contact us as soon as possible. If your child attends Saint Mary's Primary School you will be contacted anyway. While the Catholic School is fully supportive of these programmes, it is the parents' responsibility to apply for and accompany children on it. Children receive communion as individuals within their own family and in the family of the Parish, not throughSchool.